Yeh Chia-ju (third left) was part of the Chinese Taipei team that won the Skills Challenge at last month’s 13th Faldo Series Asia Grand Final. Taipei, Chinese Taipei: Chang Hsin-chiao and Chen Ting-yu may be conspicuous by their absence, but high-quality golf is sure to be on show at this week’s Faldo Series Chinese Taipei Championship. 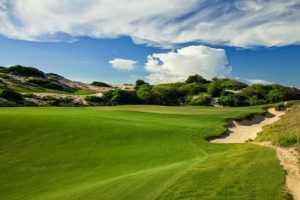 While the duo who contested a sudden-death play-off in last month’s 13th Faldo Series Asia Grand Final at Vietnam’s Laguna Lăng Cô are otherwise engaged, the current strength in depth of junior golf in China Taipei will be illustrated at the Tsai Hsin Elite Golf Club, where spectacular terrain is complemented by panoramic views of the Taiwan Straits. 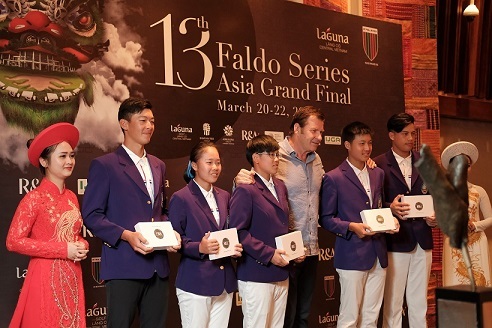 Six-time Major champion Sir Nick Faldo said: “I was hugely impressed with the performance of the Chinese Taipei contingent at the Grand Final. Three of our five age-group winners came from there. That’s a formidable effort for which credit is due to the Golf Association of the Republic of China for their efforts in promoting junior golf. “Girls from Chinese Taipei have fared exceptionally well in the Faldo Series Asia Grand Final over the past decade with Tsai Pei-ying, Hsieh Yu-ling (twice), Lin Tzu-chi, Liu Yi-chen, Cheng Ssu-chia, Hung Jo-hua and Chang Hsin-chiao all having their names inscribed on the Overall Girls’ trophy. “I remember, also, that in 2005 in Hong Kong a rising star by the name of Tseng Ya-ni wrote her name into the record books as the first Faldo Series International trophy winner. 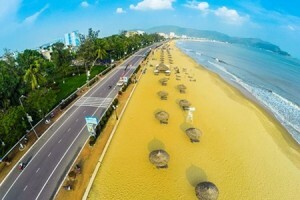 At Laguna Lăng Cô, Chen (Boys’ Under-18), Chang (Girls’ Under-16) and Chen Ling-jie (Girls’ Under-21) all topped the standings in their respective categories. For good measure, Chang had the distinction of winning the overall title, beating left-handed Chen, winner of the 22nd Faldo Series Europe Grand Final late last year, at the second hole of a play-off. Among the favourites this week will be Yeh Chia-ju, who is defending her crown in the Girls’ Under-16 segment at the Tsai Hsin Elite Golf Club, located about 30 minutes from Taoyuan International Airport and approximately 45 minutes from the Taipei Metropolitan area.